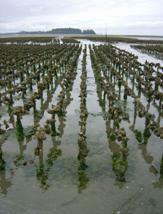 Pacific oysters growing in long lines. Welcome to the home page of Elkhorn Oyster Co., a small, family-run business, dedicated to providing fresh, quality shellstock oysters to seafood lovers. We are a licensed shellfish farm and sell product as a wholesale distributor and also sell retail shellstock to customers out of our location in Nemah, WA. Retail sales are limited, so customers need to call a day or two before they want to pick up their order to ensure product fresh out of the water. Elkhorn Oyster Co. farms just over 30 acres of pacific oysters using both the traditional ground method and longline method. All oysters are harvested by hand. Sizes available are xsmall (2 to 3 inches), small (3 to 4 inches), and medium (4 inches and over). They are available year round, by the dozen or by the bushel. Please call for pricing. Online pricing and detailed info will be available soon. 190 N . Nemah Rd. E.